Mrs Funke Fashina, a secretary to the principal of Bishop Phillips Academy, Ibadan Oyo State must be blaming herself now for slapping a 14-year old female SS2 student on the 29th of January, 2015 over what she could have over looked. 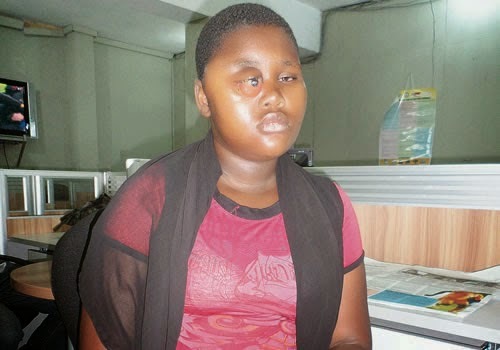 Iyanuoluwa Dahusi, the victim was with two of her friends on this particular day in school. According to her, they were inside an unused room when they spotted their teacher and wanted to greet her, on getting out, they met with the principal’s secretary who asked what they were doing in the room, and before they could explain, she slapped them one after the other. Dahunsi didn’t feel any unusual pain, but when she got home later that they, trouble started, she began to feel a slight pain, then it eloped, it became bigger and unbearable. She managed it all through the weekend before her mother who had blamed her for the slap followed her to school to tell the principal about her daughter’s ordeal. The principal was amazed, the eye didn’t look normal. So he advised her to take her daughter to the hospital and that was how the story began. Long story cut short, Mrs Fashina showed little or no concern, and never contributed any money even after bills from the hospital started coming in. When help wasn’t coming and her parents couldn’t handle the matter, they reported it at a police station. Mrs Fashina was later arraigned in court and granted bail. The matter is still very much on. Her parents are however crying out that they need more for her surgery at UCH, Ibadan, because it has been hard getting help. She also wants Mrs Fashina to confess if she used any charm on her daughter, because to her it couldn’t have been an ordinary slap.